Sooner or later, our children will be raised by robots, so it’s natural that Disney, purveyor of both robots and child-related goods, would want to get ahead of that trend. A trio of studies from its Research division aim at understanding and improving how kids converse with and otherwise interact with robots and other reasonably smart machines. The three studies were executed at once as a whole, with each part documented separately in papers posted today. The kids in the study (about 80 of them) proceeded through a series of short activities generally associated with storytelling and spoken interaction, their progress carefully recorded by the experimenters. As human-robot dialog faces the challenges of long-term interaction, understanding how to use prior conversation to foster a sense of relationship is key because whether robots remember what we’ve said, as well as how and when they expose that memory, will contribute to how we feel about them. Despite recent progress, AI remains imperfect in recognizing children’s speech and understanding the semantics of natural language. Imperfect speech recognition and natural language understanding imply that the robot may not respond to children in a semantically coherent manner. With these impeding factors, it remains an open question whether fluid collaborative child-robot storytelling is feasible or is perceived as valuable by children. An experimenter, essentially sitting in for a theoretical collaborative AI, added characters to a story the two were improvising — in some cases according to the context of the story (“They found a kitten in the cave”), and in some cases randomly (“Add a kitten to the story”). The goal was to see which engaged kids more, and when each one was more feasible for an app or device to use. Younger kids and boys stumbled when given contextual additions, presumably because they required some thought to understand and integrate — so it’s possible to be too responsive when interacting with them. On the way out from the story activity, kids would stop by Piper again, who asked them about their story in either a generic way, a way that acknowledged a character in the story and a way that in addition added some feeling to it (e.g. “I hope the kitten got out of the cave okay”). Another activity followed (a collaborative game with a robot), after which a similar interaction took place with similarly varying responses. As children begin to watch more television programming on systems that allow for interaction, such as tablets and videogame systems, there are different opportunities to engage them… We performed three studies to examine the effects of accurate program response times, repeating unanswered questions, and providing feedback on the children’s likelihood of response. 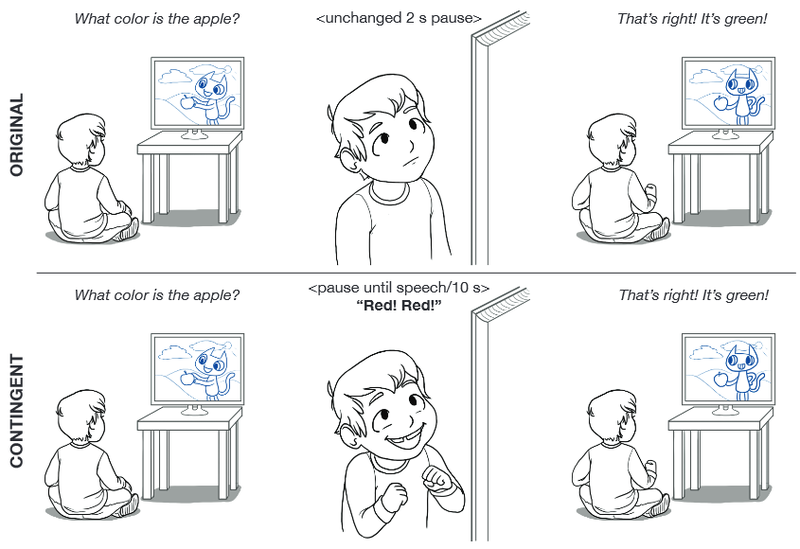 Instead of just waiting a couple of seconds during which a kid may or may not say anything, the show would wait (up to 10 seconds) for a response and then continue, or prompt them to answer again. Waiting and prompting definitely increased response rates, but there wasn’t much of an effect when feedback was included, for example pointing out a wrong answer. After doing this activity, kids popped by Piper again to have another chat, then rated the robots on friendliness, smarts and so on. What the researchers found with Piper was that older kids preferred, and were more responsive to, the more human-like responses from the robot that remembered previous interactions or choices — suggesting this basic social function is important in building rapport. All this is important not actually for letting robots raise our kids as I jested above, but for making all human-computer interactions more natural — without overdoing it or making it creepy. No one wants their Alexa or Google Home to say “would you like to listen to the same playlist you did last week when you were feeling depressed and cooking a pizza while alone in the house?” But it could! The papers also suggest that this kind of work is highly applicable in situations like speech therapy, where kids often engage in games like this to improve their understanding or diction. And it’s not hard to imagine the broader applications. A warmer, fuzzier, context-aware collaborative AI could have many benefits, and these early experiments are only the start of making that happen.